The discovery of the Minoan and Mycenaean civilizations on the island of Crete and on mainland Greece in the late 1800s gave birth to modern archaeology and opened a direct window into the European Bronze Age. This period of history had previously been glimpsed only through Homer’s epics, the Iliad and Odyssey. The Minoan civilization flourished on Crete beginning in the third millennium BC and was very advanced both artistically and technologically. The Minoans were also the first literate people of Europe. The Mycenaean civilization developed in mainland Greece in the second millennium BC. 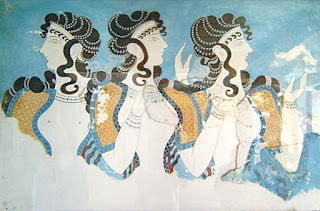 It shared many cultural features with the Minoans. The origins of the Minoan and Mycenaean peoples, however, have puzzled archaeologists for more than a century. It is widely believed that they derived from different ancestral populations. Researchers reported the first genome-wide DNA sequence data on the Bronze Age inhabitants of mainland Greece, Crete and southwestern Anatolia. They analyzed tooth DNA from the remains of 19 ancient individuals who could be definitively identified by archaeological evidence as Minoans of Crete, Mycenaeans of mainland Greece and people who lived in southwestern Anatolia. Next, they compared the Minoan and Mycenaean genomes to each other and to more than 330 other ancient genomes and over 2,600 genomes of present-day humans from around the world. The results show that Minoans and Mycenaeans were genetically highly similar – but not identical – and that modern Greeks descend from these populations. The Minoans and Mycenaeans descended mainly from early Neolithic farmers, likely migrating thousands of years prior to the Bronze Age from Anatolia, in what is today modern Turkey. "Minoans, Mycenaeans, and modern Greeks also had some ancestry related to the ancient people of the Caucasus, Armenia and Iran," explained Lazaridis.